Originally written for the Japanese magazine, Flyfisher. In the darkness of a late October morning, I arise from sleeping to check the thermometer. 17 degrees Fahrenheit. Not bad for a cloudless night; it could easily be much colder. Feels like a morning to fish. 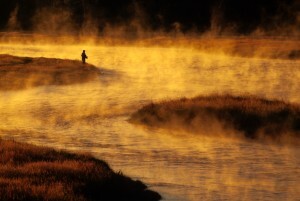 I dress myself warmly, load my gear, and head for Yellowstone Park’s Madison River. The fishing season closes in a few days, and today seems like a good time to try the meadow water below Madison Junction. Dawn breaks as I drive along the river. Ragged layers of mist drift above the currents at well-known spots like Nine Mile Hole, Talus Slope and the Crook Pool. No other fishermen are out, giving me the option of fishing any water I like. After mentally reconfirming my choice of the upper meadows, I pull into the parking turnout and see I’ll have no competition, except possibly from a bull elk and his harem of cows grazing across the river. As I don my waders and string my spey rod the bull bugles, announcing with a shrill whistle that this is his terrain, that these cows belong to him. He’ll get no quarrel from me. I’m staying on the near bank. I walk to the head of the Meadow Hole, strip line from my reel and angle a double-spey cast across the river. My fly pattern is a large soft hackle and I fish it on the swing, barely beneath the surface. Between casts I take a step or two downstream, intent on covering the entire run in a series of concentric fly swings. 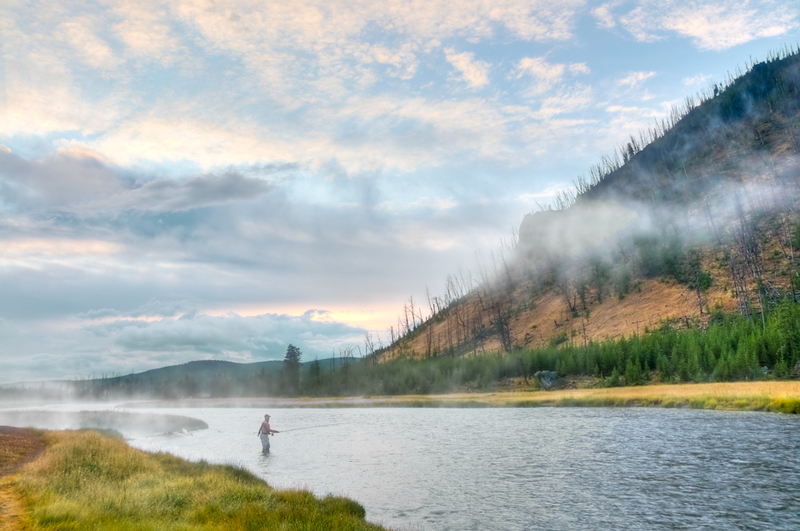 I know that a deeply fished fly will almost always take more trout, but that doesn’t matter. I find an unweighted fly more pleasurable to use. No matter how the day turns out, I’ll be content with my choice. The traditional salmon and steelhead tactic I’m using is appropriate for the Madison, owing to an autumn run of rainbow and brown trout from Montana’s Hebgen Lake. These are fish migrating upstream from the lake in preparation for spawning and are similar to steelhead, salmon, and sea-run browns in their behavior and choice of lies. The brown trout will spawn in early winter (November and December), after the Park closes. 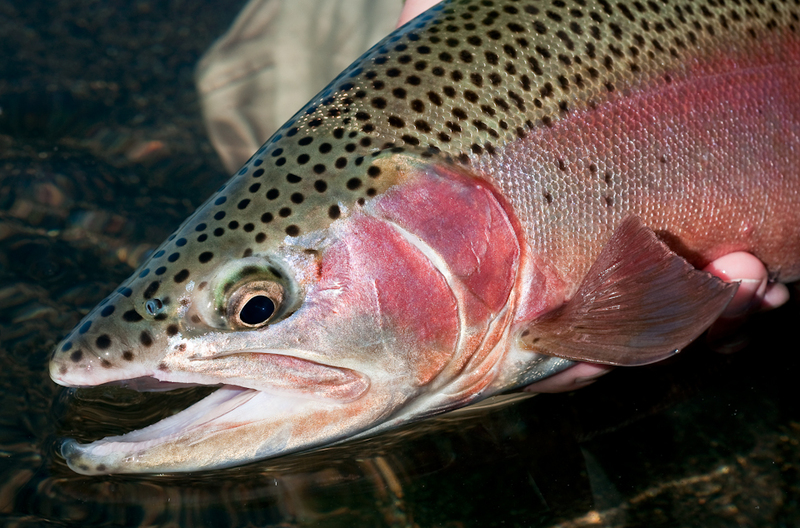 Though the rainbows run upriver concurrently, most of them will overwinter in the river and spawn in the spring as is customary for their species. Exactly why they exhibit this odd behavior isn’t known, but running in the fall makes them an important part of the fishery. This fishery is hardly a secret. For decades die-hard anglers from all over the world have been drawn here, anxious for a chance at a big brown and the acrobatic rainbows. But when you’re fishing for pre-spawning fish there are no guarantees, and a willingness to accept their moody behavior is essential to enjoying this fishing. Some days you catch them, others you don’t. While it may not be reliable (or comfortable) fishing, I still find it compelling. A major attraction is simply the rare beauty of the fish. I know of no others as pretty as these. They’re like flawless gems—perfectly proportioned, uniquely cut, each one spectacular in their individual spawning dress. I like to study them closely, enjoying their subtle details of shape and color, reveling in their wildness. If I happen to lose one of these Madison fish before getting an up-close look, I take it hard, suffering real feelings of loss and disappointment. Halfway through the Meadow Hole, in the area of a known lie, my fly swing ends abruptly. Though I feel nothing I instinctively raise the rod. The line comes tight, a fish is on. It’s the beginning of a determined fight. This is a trout in prime condition, having amassed an impressive reservoir of strength from its summer in Hebgen Lake. As it races around the pool I quietly hope my fly holds. The fish’s effort is game, peppered with two late jumps during which I can see it’s a brown trout. Soon enough I realize I’m going to win this battle. As I draw the fish near, I see that it’s a fine male, slightly above average size, perhaps twenty inches and three pounds. From head to tail he’s covered in shades of gold and copper, a perfect backdrop for the brilliant red spots that grow thick along his tail. I cradle the fish in my hands, free the hook, and await his recovery in the icy water. I can’t stop looking at him. Inside me I feel a need to sear this experience, this particular fish, into memory. This late in the season you never know which trout will be your last, and I can’t take any chances. Memories of fishing sustain me through the winter, and in this part of Montana winters are long. Finally the brown regains strength and with a sharp twist of the tail bolts for deep water. He’s going to be okay. I think to myself, I’m going to be okay too. For if this is my last fish of the year—my last memory—then I’m a lucky angler, indeed.